Since I last wrote, I had the luck to cross woven paths with a lady who lives on Hainan Island in southern China. She found her way into my inbox via my blog after she had spent time with some backstrap weavers on Hainan Island from the Li minority group. I imagine that it had been a very intense time watching the weavers at work trying to absorb and make sense of everything they were doing. Megan told me that although she speaks Mandarin, the weavers speak a local dialect. They were only able to communicate using some very basic Chinese words. It reminds me of weaving with Quechua-speaking ladies here in Bolivia and Peru. One of my teachers had the habit of throwing a word in Spanish at the end of long sentences in Quechua hoping, I suppose, that it would somehow give context to what she was saying. Believe it or not, it sometimes actually did help me to get the gist of what she was saying! None of it was instructional, though. It was basically chit-chat and the way that we tried to bond talking about our families. Here’s Megan observing one of the Li weavers at her foot-tensioned loom. She told me that the loom had been warped and fabric had been woven before she arrived and so she was able to watch the steps to creating the patterns with the supplementary weft threads but had not had a chance to see the loom being set up. She took home a loom with its partly woven fabric but was understandably a bit confused about the process and unable to sit and continue the weaving on her own. As she was about to travel to Europe and wanted to take the loom with her, she did not have a chance to return to the weavers and have her questions answered. I am glad she found me! She sent me a brilliant high-resolution photo of the loom with the parts numbered and an email in which she named the parts as best she could. I love to trouble-shoot but I can’t do so without good pictures that I can enlarge. I couldn’t have asked for more from the pictures that Megan had sent me. The piece is decorated with supplementary weft. 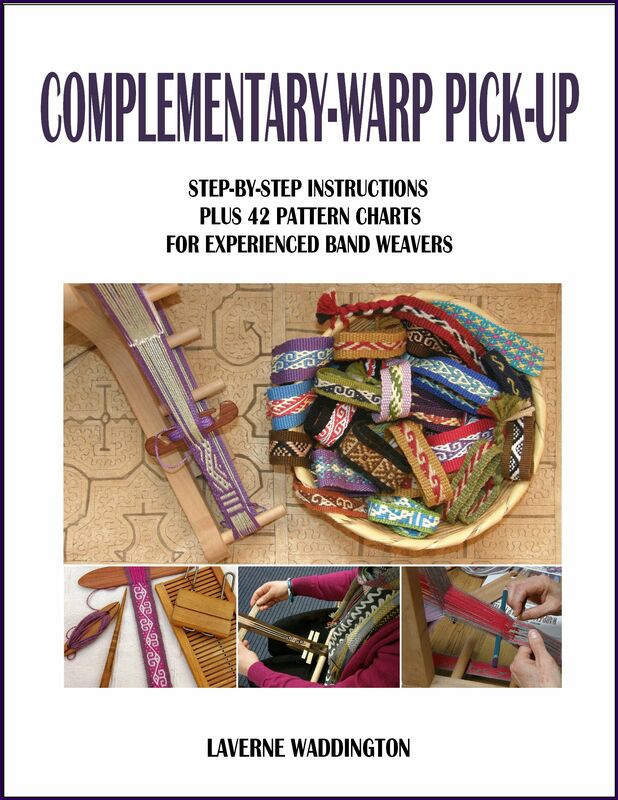 It was exciting because I had seen Li backstrap looms when I was at Convergence in 2010. Pam Nadjowski had a booth in the Vendor Hall with textiles and weaving implements of various Chinese minority groups and the Li loom was one of them. That’s it pictured below. I was tempted to buy one because the pieces were so beautiful However, I eventually settled on buying two fine bamboo reeds instead that have served me very well in my weaving projects. Pam had sent me and allowed me to use pictures of the Li weavers that she had taken during the Santa Fe International Folk Art Market one year. 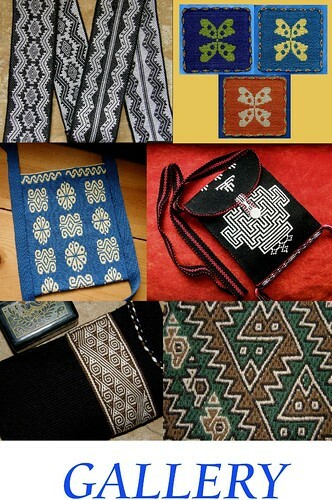 Clearly they use several different kinds of techniques to decorate their woven cloth, not only supplementary-weft inlay. I love the paddle-like ends of the beam against which the weavers place their feet. Megan’s loom is much simpler. I like how a piece of plastic tube has been used in hers as the shed rod. The caps on the ends are handy for helping to stop the rod from sliding out of the warp. Weavers in Peru often use pvc pipe for the shed rod in their backstrap looms. They thread a safety string through the hollow pipe and tie the ends together which helps to stop the pipe from sliding completely out of the warp. You can see how beautifully the paddle ends on the Li loom are decorated in my photo from Convergence. When I examined the photo with the numbered parts that Megan had sent me, I was excited to recognize the set-up as one that had been taught to me by two of my weaving teachers in Guatemala in 2008. That’s one of my teachers, Carmen, in the picture at left. I have even written a tutorial on this blog for the set-up and technique. Here she is contentedly weaving at her loom….I have to say that she seems to have the right toes for this. Now we can take another look at the picture Megan sent me with the numbered parts and I can name them for you. The rods hold a circular warp which are, as far as I know, far more common in Asian backstrap weaving than single-plane warps. In South America I have only seen circular warps used by backstrap weavers in Ecuador and I have read that they are also used in far northern Peru. The Vietnamese hilltribe weavers with whom I studied also use circular warps as did the Burmese weaver that I spent some time with one day. Half the black warp threads lie on top of the shed rod. The other half are enclosed in heddle loops and are raised when the weaver lifts the heddle rod. Patterning shed stick 1 holds certain threads from the shed-rod shed. Patterning shed stick 2 holds certain threads from the heddle shed. It’s these threads under which the supplementary weft is passed to form the patterns. The patterning sticks raise groups of threads and the weaver selects threads from these groups according to the pattern she is creating. Here’s the video that I created a few years ago to show how to set up a warp with these patterning sticks. I am using heavy cotton thread and a really narrow warp just to demonstrate this. The second part of the same video shows how to operate the loom and use the sticks to create patterns. You can pass the supplementary weft from one edge of the cloth to the other as Megan’s weaving friend has done or you can create smaller discontinuous patterns by passing the weft back and forth just from edge to edge of the motif itself as I demonstrate in the video. My Guatemalan teachers use both techniques. You can see the rest of that tutorial here. This is the cloth that my teacher and I wove together in Guatemala. The X patterns used continuous weft from edge to edge. The little figures were woven using the discontinuous method. Simple inlay as well as wrapping and soumak-like techniques are used to create these kinds of patterns. The blue checkered pattern is supplementary weft passed through the two unaltered patterning sheds. I used these methods to weave this cotton scarf some years after that trip…. Every now and then a student will bring me a warp that they bought in Guatemala with partly-woven cloth and I get to play on it! You can see the two patterning sticks in the warp just to the left of the shed rod….one on top and one below. Guatemalan weavers use single-plane warps rather than circular ones. I found that I could no longer roll up the woven cloth around two beams as I usually do, as the little built-in pocket is bulky and was creating a bump. That was messing with the tension on the unwoven warp threads. So, I removed the cloth beam and had to find another way to attach myself to the piece so that I could continue weaving and be in comfortable reach of the weaving line and heddles. I have clamped the cloth between the split beam. I add another beam and can roll the cloth around both. Two rolls get me to a good position where I can start weaving again. That is working well. Now I am on the home stretch having passed the half-way mark and have finished the diamond section of the pattern. Now I will weave the two weaving ladies again. This time I get to weave them the right way up rather than standing on their heads! I am thinking of trying to design a tree under which they can sit and weave in the shade. Progress hasn’t been as fast as it could have been because I am working on another book. I realized that it is not often that I get to spend this much time at home and that I really need to take advantage of that. Too many of my book projects have been started and left standing with the interruption of travel. 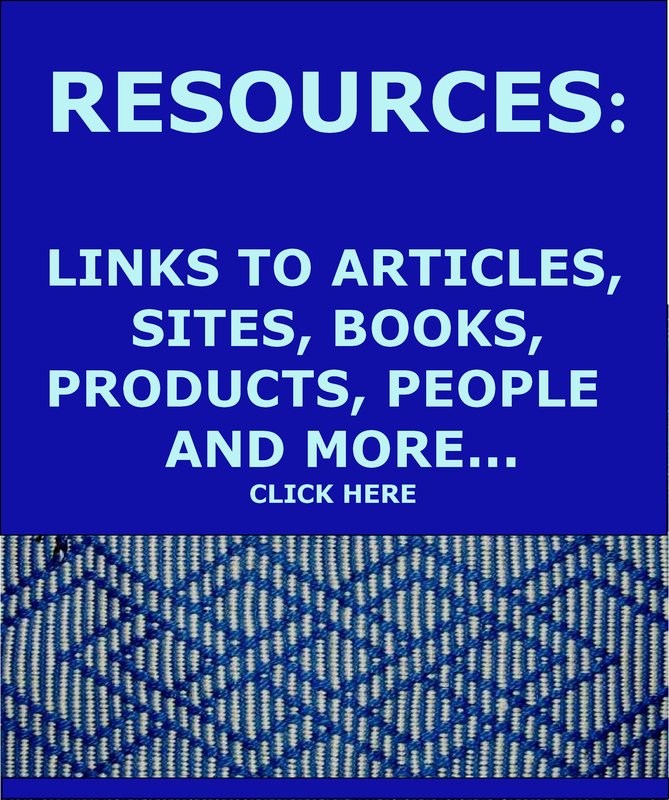 I am also very buzzed about the fact that I can include video clips with my publications on Patternfish. This is highly motivating! Here are some projects from students and online weaving friends…..
Christine, who came to weave with me in Maine, is using a Harrisille Designs band lock, in much the same way as I am using the split beam, to clamp her band. She took this project away with her and reported that this was the easiest way to bring weaving along on her trip in carry-on luggage. Caroline designed and wove this cute snail motif on a warp-faced double weave band that we started together. Gonit Porat in Israel wove a fabulous band with several patterns from my book of traditional and original Andean Pebble Weave designs. She uses the two-heddle method which is just one of several ways to set up a loom for this structure. Click on her name to visit her website and see the amazing work she does with hundreds of tablets. Yehudit is making striking key fobs using patterns from my Complementary-warp Pick-up book. 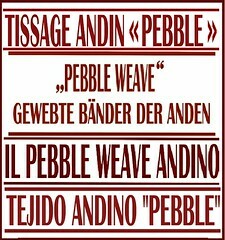 That book shows another way to create Andean Pebble Weave patterns without using additional string heddles. And this is what Lenora is weaving using the same book. It is amazing how a little imagination in the arrangement of colors in the borders can give a band an extra bit of zing. I love it. Lausanne finished the wool band with its aquatic patterns that she started during my visit to Vermont last year. 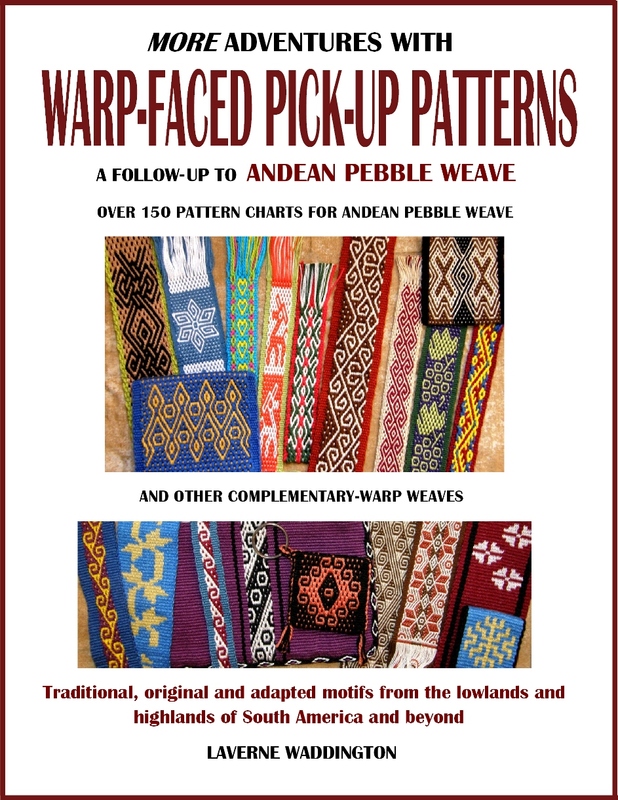 She also used the two-heddle method for these Andean Pebble Weave patterns that are charted in my Pattern Book. And, I was right in guessing that Kristin would be the first one to show me a project in which she wove and sewed the eye-pattern tubular band as an edging for her hand-woven cloth. This was all made with her own hand-spun alpaca yarn. It’s a beautiful finish for this piece. Oh my, these little bands are just like potato chips, but way healthier. I just can’t stop at one! I was in a bit of a weaving slump, but now I’m dreaming of things I can weave, just so I can add this lovely edging. I can hardly wait to finish one band so that I can try another in a different colour combo. I’ve been waiting for a book like this for years, down to earth and easy to understand. Thank you Laverne! Lizzie Ruffell has been weaving bands using some of the knot-work pattern that are charted in my second book. She says that she is now completely comfortable with the spotted charts, has managed to adapt a tablet-weaving pattern (the dragons) to pebble weave and chart it, and is keen now to create some designs of her own. While my northern hemisphere friends huddle indoors away from some of the coldest temperatures in decades, and Australia recovers from its recent heatwave, I am enjoying a few days of cooler temperatures here. I was filming video clips during a stretch of particularly hot days last week (I still can’t get a tech to come out and look at my broken air conditioner!). I have to get myself into some pretty awkward positions sometimes to film and give people the weaver’s view of what I am doing. At one point I had to stop filming because sweat from my forehead was dripping onto the band I was attempting to weave. I can tell you that holding some of the positions is doing my abs a whole lot of good! I will leave you with a bright band and some spring-like images to brighten up your cold days, or soften some brutally hot ones. I call this band Birds, Bees, Butterflies and Blooms. Your discussion of Megan’s foot braced backstrap loom was wonderful. I have a collection of Hainan textiles (mostly ikat textiles) and seeing the parts of a loom from Hainan was most interesting although the patterning shed sticks would not be necessary when weaving an ikat textile from the Meifu Li group. Thanks to both of you. I am so glad you and other inquisitive and adventurous weavers are continuing to explore and record and analyze.